Heavy congestion caused by roadworks could soon become a thing of the past after plans were proposed to charge utility companies up to £2,500 a day for digging up roads during peak times. The idea significantly reduced delays when it was trialled in Kent and London recently, slashing congestion on the busiest roads and saving drivers time whilst boosting the economy. Now, the concept it is being rolled out nationwide with the Department for Transport (DfT) set to produce guidance this autumn to help councils develop lane rental schemes for approval. As such, the first schemes could be in place by the end of 2019. These schemes incentivise utility firms to work on lesser used roads during peak times or only dig up busier stretches outside of rush hour. Some companies may even collaborate to stop roads being dug up multiple times, reducing the impact of roadworks on drivers. A consultation by DfT in 2017 found that the majority of respondents supported the idea of rolling out the concept nationwide. Many said they wanted to take advantage of the ‘clear benefits’ of lane rental schemes. During trials in London, some of the worst congestion caused by planned utility works was halved on roads where lane rental was in operation. A spokesman for the RAC said many motorists accept that some roadworks and congestion are unavoidable, but lengthy and unnecessary queues make them incredibly frustrated. 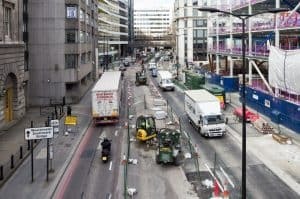 Around 2.5 million roadworks are carried out every year, hitting the economy to the tune of £4 billion in increased costs to businesses through late employees or deliveries.